We all scream for homemade ice cream! A friend of the family sent us a gift certificate to Crate & Barrel all the way from Italy! It was such a nice gesture. 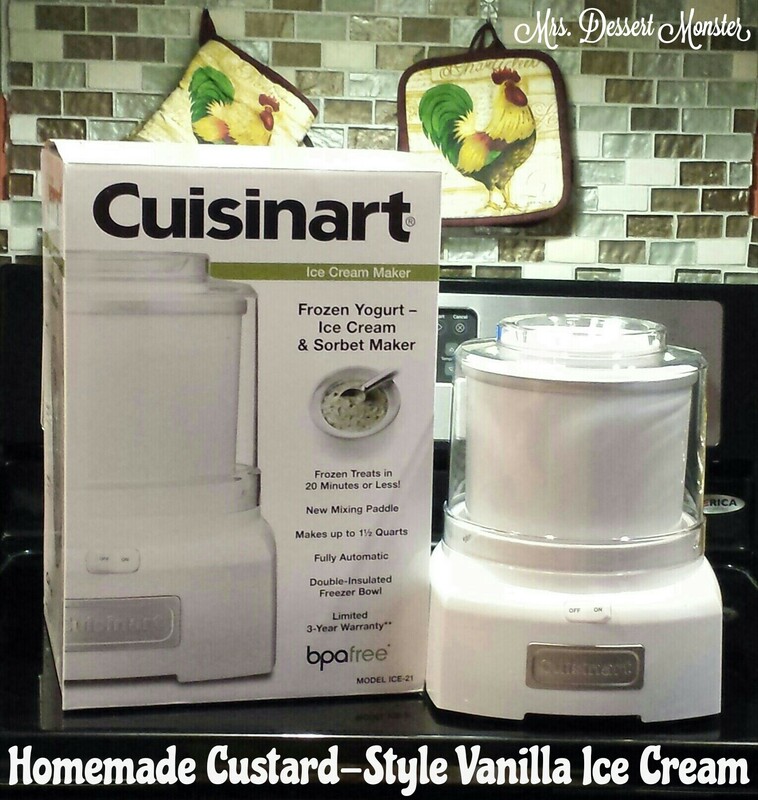 My husband & I ordered the most practical thing we could think of: an ice cream maker! We anxiously awaited its arrival. In the mean time I had made some chocolate mousse (a recipe for another post this post!) & had some left over egg yolks. Thus the idea for custard-style ice cream was born. While we waited for the machine to arrive I looked up some recipes, but I ended up using the one from the Cuisinart recipe booklet with some minor changes. Instead of whole milk I used 2%, and I couldn’t find vanilla bean at the store, so I just omitted it. There are plenty of simpler ice cream recipes out there, but since this one has egg yolks it requires some cooking (for food safety reasons). We invited our friends from church, Bobbin & Co. & her husband, over for burgers & the inaugural ice cream. Before they arrived, I gathered my ingredients: milk, heavy cream, sugar, salt, egg yolks, & vanilla extract. 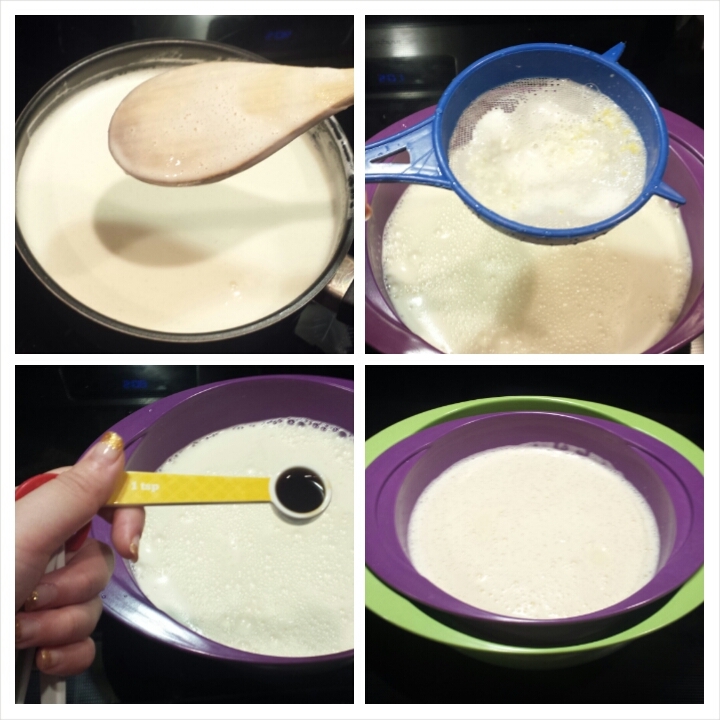 The milk, heavy cream, salt, & half of the sugar got whisked together in a medium sauce pan over medium-low heat. Once combined, I brought the milky mixture to a slight boil. While that was heating up, I beat the remaining sugar & egg yolks together on low until pale & thick. This recipe was a lot of fun for me because I also got to use my new favorite toy: the Kitchenaid mixer. I told my husband that I was looking forward to getting married long before he came in the picture because I knew the first thing on my registry would be a red Kitchenaid mixer. And it was! Once the milky mix was boiling, I added 1/3 of it to the yolky mix & beat until combined. Then I added another 1/3 & used the stir setting on the mixer, before returning this new combination to the saucepan with with remaining 1/3 of the milky mix. Stirring with a wooden spoon, I cooked the mixture on low heat until it thicken slightly. I had to confer with my husband on what exactly ‘coating the back of the wooden spoon’ was, and I think we did a good job deciding. The next step in the recipe said to strain the mixture. I almost skipped this step since I had omitted the vanilla bean earlier, but I’m glad I didn’t. The strainer got out all of the bits of egg yolk & what not, and I ended up with a nice & creamy ice cream in the end. At this point, I tasted the warm liquid & it reminded me a lot of the sweet cream flavor from Cold Stones, so I’ll definitely have to experiment with that in the future. Once we were done with dinner, I poured the mix into the ice cream maker. After a 20 minute spin cycle, the first ever batch of ice cream was ready, but it was too soft to serve right out of the machine. So I poured it into an airtight container and put it in the freezer. Cuisinart suggests putting it in for 2 hours, but we couldn’t wait that long. Once our burgers were sufficiently digested, about an hour later, we served up some ice cream. It was delicious! I think the taste can be compared to Blue Bell’s vanilla ice cream. There was no ice cream left at the end of the night! Batch #1 was a huge success. 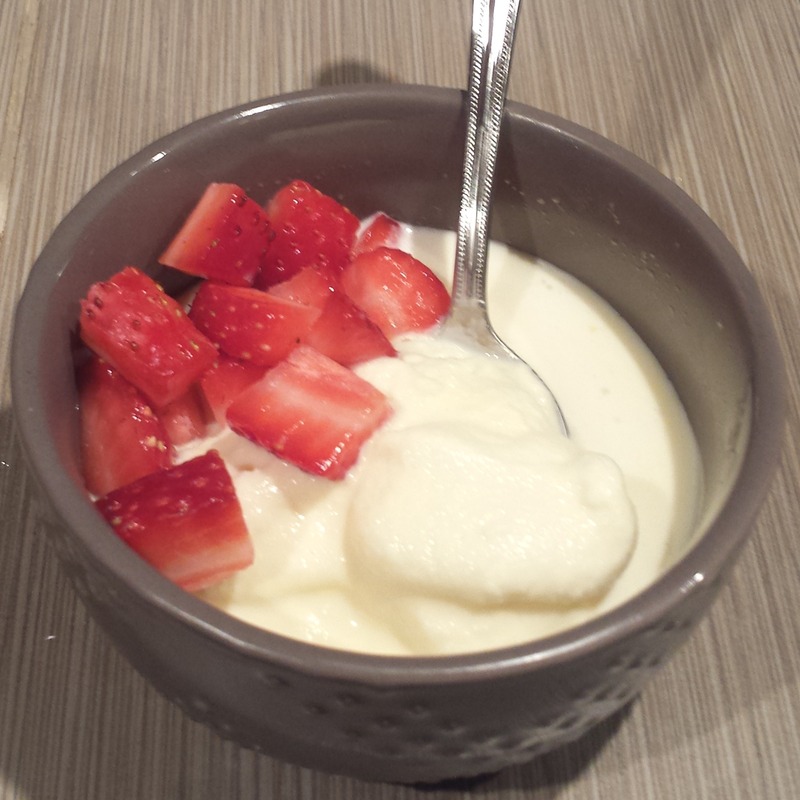 In a medium saucepan set over medium-low heat, whisk together milk, cream, half the sugar, and salt. Bring the mixture just to a boil. 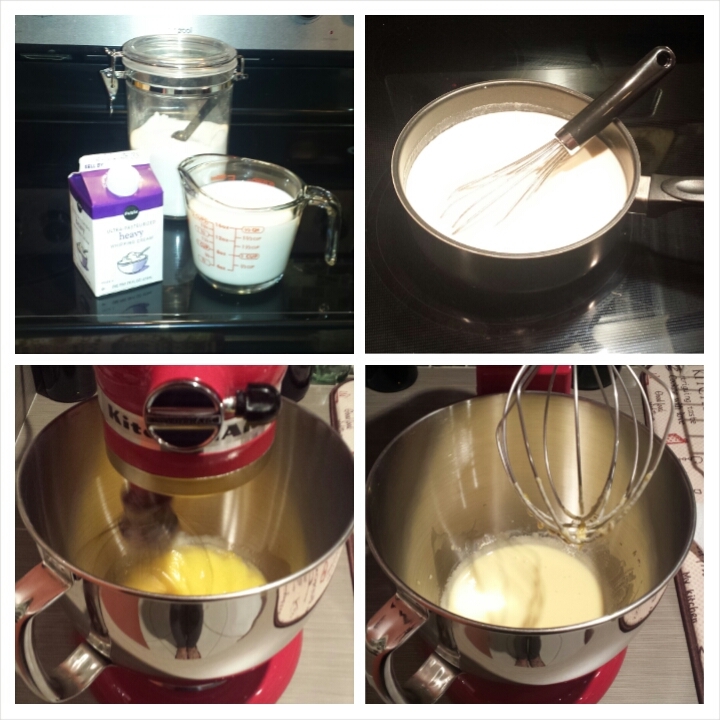 While the milk/cream mixture is heating, combine the yolks & remaining sugar in a mixer bowl. Beat on low until the mixture is pale and thick. Once the milk/cream mixture has come to a slight boil, beat about 1/3 of the hot mixture into the yolk/sugar mixture. Add another 1/3 of the mixture, stir, then return the combined mixture to the saucepan. Using a wooden spoon, stir the mixture constantly over low heat until it thickens slightly & coats the back of the spoon. Do NOT boil the mixture – egg yolks will over cook. Strain the mixture. Add the vanilla extract & bring to room temperature. Cover & refrigerate for 2 hours. Turn on the ice cream maker, pour in the mixture, & let mix for about 20 minutes. The ice cream will be soft. 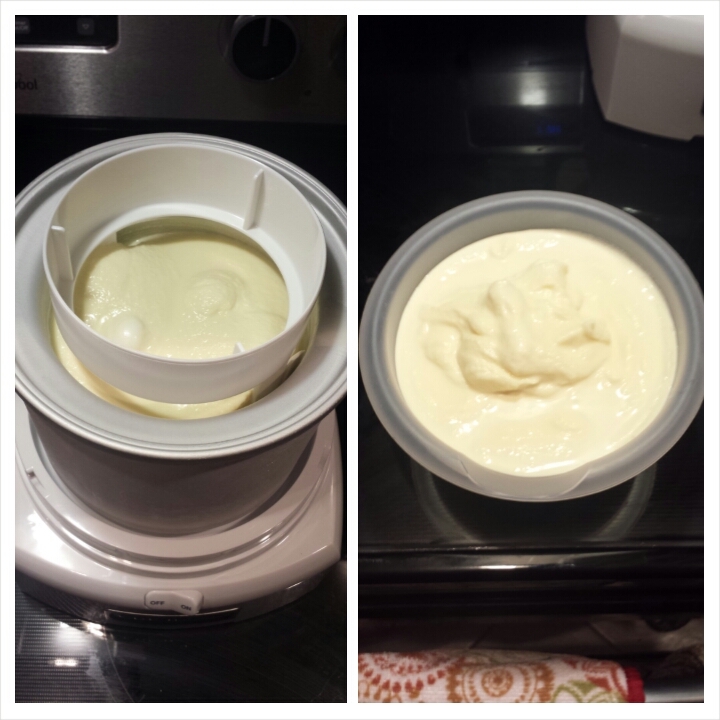 If a firmer consistency is desired, transfer the ice cream to an airtight container & freeze for 2 hours. ← New Year, New Blog! Thank you! I will definitely be making more! David and I just tried out his ice cream maker for the first time Sunday. It came out the same consistency as yours, and we ate some that night, but after a day in the freezer it had the harder texture of regular ice cream. I suppose patience is the key. We made some chocolate ice cream last night, the simple recipe without eggs, and it actually came out like good ice cream consistency after only 15 minutes. I think the bowl was much colder this time since it’s been in the freezer for days.